All eight climate models surveyed by Australia’s Bureau of Meteorology suggest tropical Pacific Ocean temperatures are likely to remain neutral for the second half, it said on its website on Tuesday. That reverses a June 6 report that showed four models predicting temperatures may exceed El Nino thresholds during the second half of 2017. The bureau reset its outlook to inactive as the chances of El Nino forming this year fade. The U.S. earlier this month said the odds of it emerging between October and December were 36 percent from 46 percent previously predicted. Forecasts during the southern hemisphere’s autumn tend to have lower accuracy and begin to improve from June. El Nino and its La Nina counterpart can roil agriculture markets as farmers worldwide contend with too much or too little rain. The previous El Nino ended in May 2016 and was the strongest since the record event of 1997-98. It reduced rainfall in the Indian monsoon and curbed production of cocoa in Ivory Coast, rice in Thailand and coffee in Indonesia. 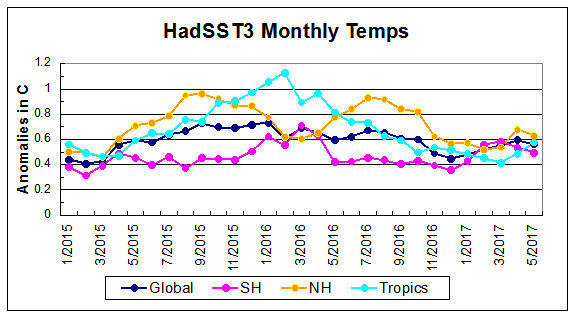 Far eastern Pacific Ocean sea surface temperatures, which were above normal near the Peruvian coast in March and April, cooled during May and June, according to the weather bureau.